The Goal Zero Yeti 1400 Lithium Solar Generator Kit is the next generation of portable, award-winning power. Engineered from the ground up, the Goal Zero Yeti Lithium paired with the New Boulder 100 Briefcase Solar Panel, is one of the most versatile and innovative power station kits on the market. Its built-in surge allowances and multi-stage protection means great compatibility with more devices ranging from lights to laptops, refrigerators to power tools. • MPPT Included - Includes solar charging optimization module that functions as a maximum power point tracker (MPPT), resulting in up to 40% faster charge times, especially from solar panels. 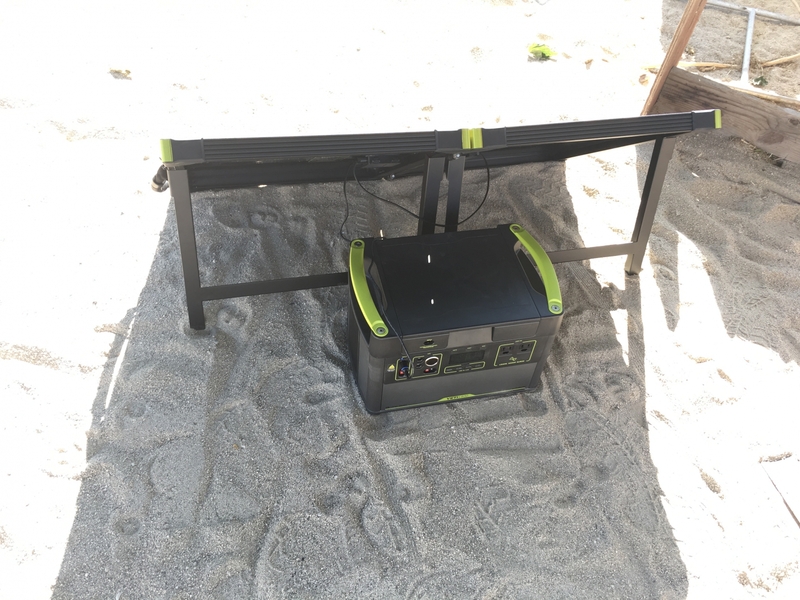 • The Boulder 100 Watt Briefcase Solar Panel is built with strong tempered glass and an aluminum frame with added corner protection for temporary or permanent installation. Composed of two Boulder 50 Solar Panels (100 watts total) chained together and connected by a hinge. Equipped with an integrated kickstand to help get optimal angle to the sun. Included a protective canvas bag for easy carrying. 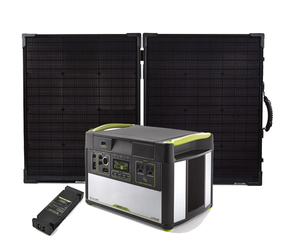 The Goal Zero Yeti 1400 Lithium can be charged by connecting the included solar panel. If you are a standard or light user and use about 30-40% of the power per day we recommend 1 Boulder 100 Watt Briefcase Solar Panel. If you are a heavy user using all the power in one day, we recommend using 4 Boulder 100 Solar Panels to recharge. MPPT stands for Maximum Power Point Tracker. 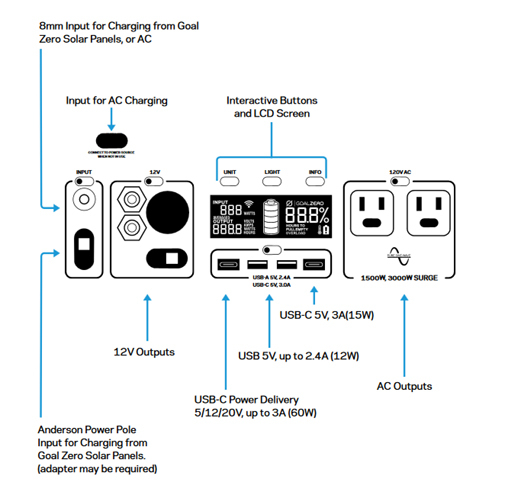 The Solar Charging Optimization Module is an external MPPT and when installed properly, actively monitors the energy source you're using to charge the Goal Zero Yeti Lithium and optimizes the source to maximize power, resulting in up to 40% faster charge times, especially from solar panels. You may also notice better charge times from AC when utilizing the Yeti Lithium's AC charging cable plugged into the module. How many solar panels can I plug into the module? There are three inputs on the module that can be used at the same time; however, do not exceed more than 22V under standard use, as this can result in damage to the Yeti Lithium and potential bodily injury. We recommend chaining solar panels in parallel (positive to positive, negative to negative, etc). We�ve taken the guesswork out of chaining when using Goal Zero Boulder Solar Panels, the 8mm blue-ringed connector and combiner cables properly chain our panels together for approved use with the Yeti Portable Power Stations. Can I plug solar panels into the module and the Goal Zero Lithium input ports at the same time? Yes; however, we recommend using the module�s inputs for solar panels since it can optimize the charging efficiency up to 40%. You may even notice up to 20% more efficiency when charging the Yeti Lithium from the wall when using the module. Chainable: Yes: Up to 400W. Recharge your Yeti Lithium Power Packs up to 5 times faster with the 25A AC Power Supply! Only for use with the Yeti Lithium 1000 and above. Designed for use with Yeti Lithium 1000, Yeti Lithium 1400 and Yeti Lithium 3000. The Yeti Link allows for an easy plug and play solution for adding additional Lead Acid batteries to the Goal Zero Yeti Lithium 1000, Lithium 1400, and Lithium 3000. Designed to be paired with the Yeti Tank. A plug-and-play solution to maintain the multi-use portability of the Yeti Power Station while increasing storage capacity with cost-effective, lead acid batteries. We�ve taken the confusion and guesswork out of building long-lasting energy storage with the Yeti Link Expansion Module and Yeti Tank Expansion Battery. A plug-and-play solution to maintain the multi-use portability of the Yeti Power Station while increasing storage capacity with cost-effective, lead acid batteries. We�ve taken the confusion and guesswork out of building long-lasting energy storage with the Yeti Link Expansion Module and 2x Yeti Tank Expansion Batteries. Power Outage? No problem. 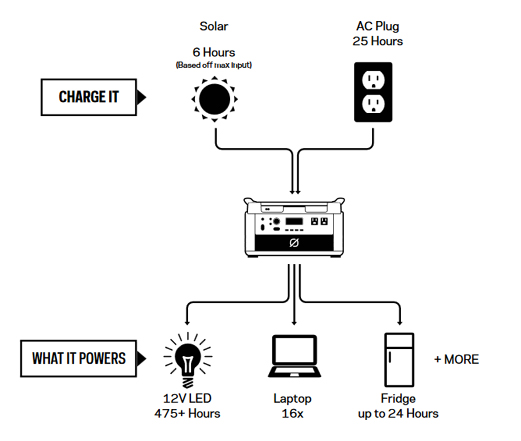 The Goal Zero Yeti Home Integration Kit is an easy-to-install way to use your Yeti Portable Power Station to keep essential circuits in your home running, even when the power isn't. The 4x 8mm Combiner to Anderson Connector is designed to safely combine two or more Goal Zero Solar Panels with 8mm outputs into an array with a single Anderson Power Pole (APP) connector. For use with larger Goal Zero Yeti Portable Power Stations with an APP input such as the Yeti 1250 and Yeti 1400 Lithium Power packs. Get up to 52 servings of gourmet food that's easy to prepare during emergencies and other dire situations. The Wise Company Prepper Pack Bucket is an easy-to-store and an easy-to-carry solution when it comes to preparing for any calamities. One of the reasons I bought this particular generator was the video in which a rancher (like myself) takes his chop saw out to a remote pasture and cuts some fence posts. The 1400 will not run my DeWalt chop saw, I'm disappointed. It does run my table saw, skill saw and drills and will come in handy. Very Practical and Great for camping! We used this for a 4 day camp, charging a portable fridge, freezer, and 5 phones! The Solar Panels kept it charged and everything connected running. Charging our phones was very easy and the best part was coming back from day of activity and having the best ice cream sitting in the freezer waiting for us, the kids loved it. The fridge worked great and everything in the freezer stayed frozen. ProsPractical, worked great, not heavy,and looks good. I'm still experimenting with the new unit but so far I very pleased. I don't eat and sleep with the item so I'm never sure why it's so important to answer this request to write reviews. I'm not someone who lives to make out reviews as my favorite thing to do. Enough said. Best UsesSo far just charging small electronic items to exercise the Yeti. I'm giving this a 4 due to the fact I haven't had a chance to use it. the service has been great the shipping was on time. everyone I spoke with at Earthtech was very helpful and informative. I would recommend them. What is the sound level. Many campgrounds do not allow generators after dark. Yes, this system is going to be silent. There will be an internal fan that will turn on intermittently but it is not loud at all. You will have no issues with noise. Thank you for your inquiry! would you be able to recharge this unit using a 500 watt inverter hooked to a car battery and if so, howlong would it take to charge? 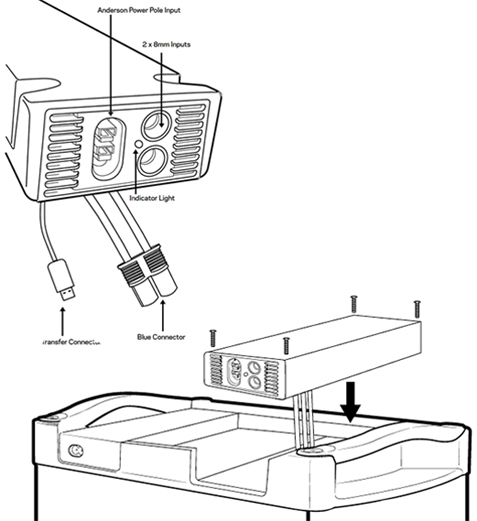 The Yeti 1400 Lithium unit can be charged via an AC inverter by using the included AC power supply cable. Recharging via AC power supply takes roughly 25 hours to recharge from completely empty. Please note, you cannot recharge this system via 12V power. Thank you for your inquiry! While in use as a generator powering a fridge for example can the solar panel plugged in extend the number of usable hours or are you not supposed to recharge the unit while in use? Yes, you can output power while recharging the system simultaneously. Thank you for your inquiry! If my Car has an 110 Volt outlet can I recharge the Unit ? Yes, you would be able to recharge the unit using your 110 volt outlet in your car. Please let us know if you have any additional questions. Thank you for your inquiry! I use an Invacare Platinum 10 Oxygen Concentrator (4.9 amp / 120 volts). Would the Yeti 1400 be able to support it, and if so, for how long in the event ot a power outage? The Yeti 1400 would be able to power that item for 25 hours on the internal battery storage alone. However, with the included solar panel you would see a longer operation period provided there is plenty of direct sunlight. Thank you for your inquiry! Yes, that is correct. This kit includes everything needed for full operation and does not require any add on items. Thank you for your inquiry! would this unit power a 5,000 btu window ac? Unfortunately, we would not recommend this product to power an AC unit. You would require a much larger system. Such as the 12 kwh solar system: https://www.earthtechproducts.com/12-kwh-solar-generator-kit.html Thank you for your inquiry! Does this unit have an indicator telling how full the battery is? Yes, the LCD screen will provide information pertaining to the current battery level. Thank you for your inquiry! The Goal Zero Yeti 1400 Lithium Portable Solar Generator features a Lightweight Li-ion NMC 1425Wh (10.8V, 132Ah) battery. Thank you for your inquiry! Can this be used as full time off grid with solar panels attached? Yes, it can be used full time, the operation period will vary based on your power draw. This unit is designed for small to medium power usage. Thank you for your inquiry! Are the replacement batteries available yet, and what is the price? Can it be done by the consumer? There are no replacement batteries available at this time and there is no definite date as of this moment but be sure to check back with us again! CaI add multiple sets of solar panels? This unit can handle up to 360 watts of input power. We recommend (4) Boulder 100 Watt Solar Panels to max the input power while factoring in the expected loss. Thank you for your inquiry! Do you get an extension chord with the package? If so, how long? The length of the cable from Solar Panel that would connect to the Yeti is 68 inches long and is 16 Gauge. The Yeti 1400 Generators are not chain-able. Thank you for your inquiry! My refrigerator, which has an energy star, runs on 15 amperes. Will this generator be able to power it? If your fridge is a standard 26 cft. energy star fridge then the average wattage is around 72 watts. Since this generator is provides approx 1428 watt hours, it will run your fridge for approximately 15-19 hours. If you have any other questions please feel free to contact us at 1-877-548-3387 or email us at info@earthtechproducts.com. Have a great day! How many 'charge' / 'discharge' cycles, representing the life of the battery pack, are available with these units? Does the shelf life represent the length of time that a charge is maintained? Thank you. The Yeti 1400 features 500 Cycles to 80% capacity on the internal Lithium Battery.Yes, the shelf life represents the length of time that a charge is maintained. Thank you for your inquiry! During a power outage, how effective are the solar panels as a main source of power? Typically Solar Generator systems are very effective in operating the essentials, such as refrigeration, LED lights, fans and recharging smart devices. Thank you for your inquiry! I can't find any information about replacing used batteries for the Yeti 1400. Where to get the replacement batteries and how much they cost? The replacement batteries are not yet available. We are expecting their release within the next 2 months. Once they become available, an exact price will be stated as well. Thank you for your inquiry! Could this unit be charged from a 12v battery or car cig plug? This portable generator cannot be charged via 12V battery or car outlet. It can be charged via wall outlet or Solar Panel. Recharging the unit using both the wall outlet and solar panel simultaneously would be the fastest recharge option available. Thank you for your inquiry!